Is your 5th grader being hassled by decimals? This printable fun math worksheet is just the right way to go about giving her lots of practice in the concept. 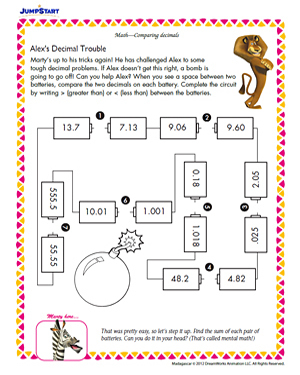 Help Alex with his decimal dilemma by comparing two decimals and helping him figure out which one is bigger. By the end of the worksheet, decimal comparison will turn out to be child’s play.